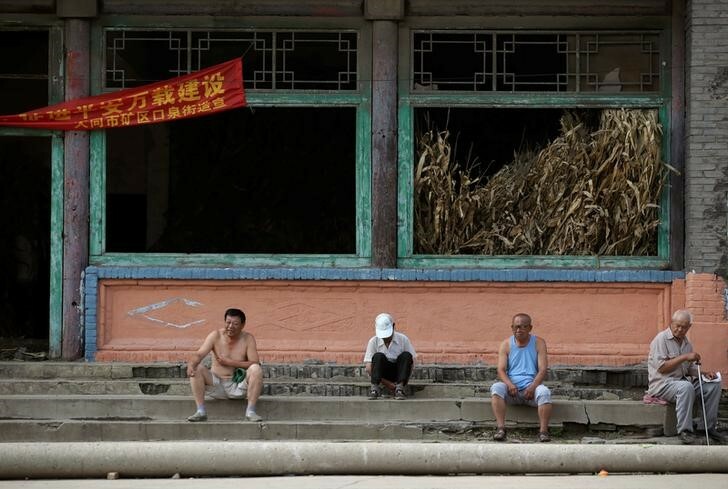 Villagers sit on stairs outside an abandoned old theatre building in an area where land is sinking near a coal mine in Kouquan township of Datong, China’s Shanxi province, August 1, 2016. Photo: Jason Lee/Reuters. 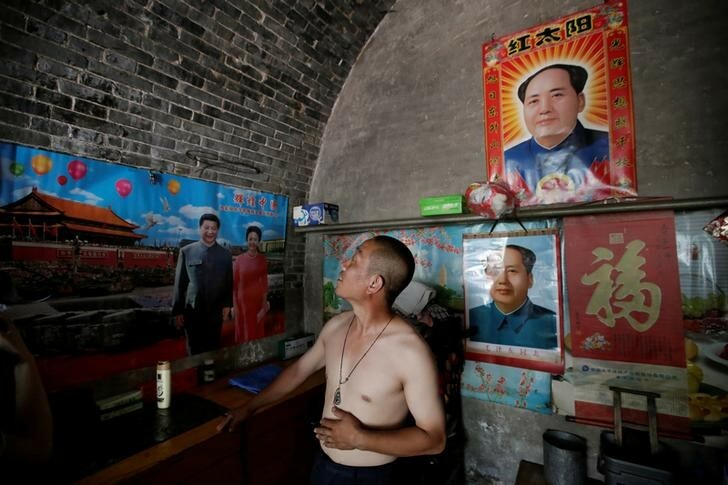 Wang Junqi looks at a crack on a wall inside his damaged cave house in an area where land is sinking next to a coal mine, in Helin village of Xiaoyi, China’s Shanxi province, August 2, 2016. Photo: Jason Lee/Reuters. 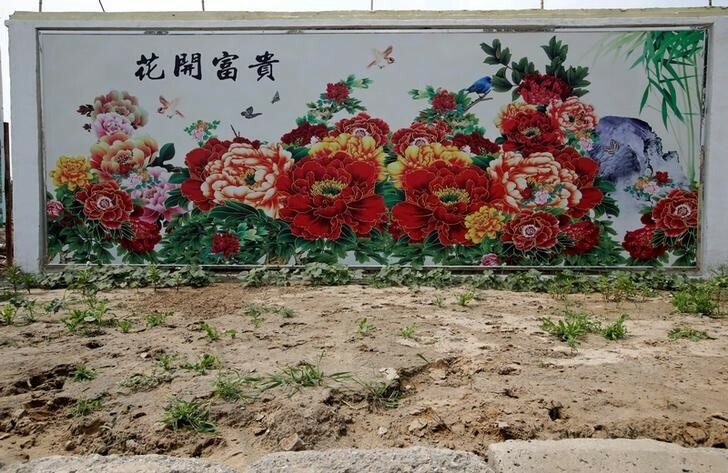 A flower wall painting is seen in an area where land is sinking next to a coal mine in the deserted Liuguanzhuang village of Datong, China’s Shanxi province, August 1, 2016. Photo: Reuters/Jason Lee. 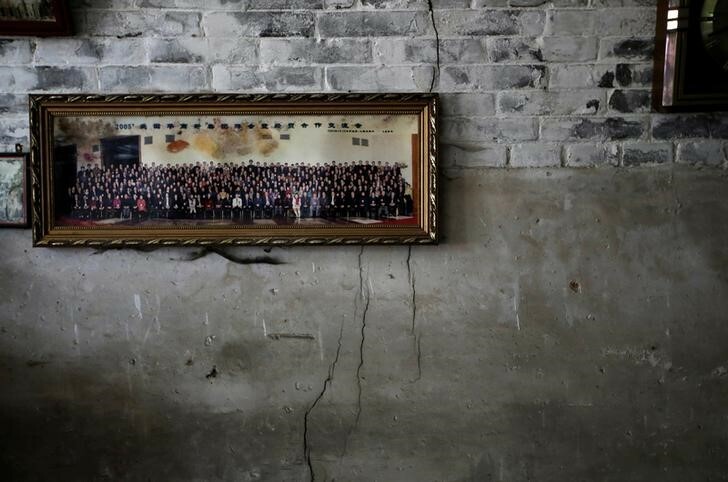 A group photograph hangs on a damaged wall at Wang Junqi’s cave house in an area where land is sinking next to a coal mine, in Helin village of Xiaoyi, Shanxi province, August 2, 2016. Photo: Reuters/Jason Lee. A worker operates a vehicle at a coal mine on the outskirt of Xiaoyi, China’s Shanxi province, August 3, 2016. Photo: Reuters/Jason Lee. 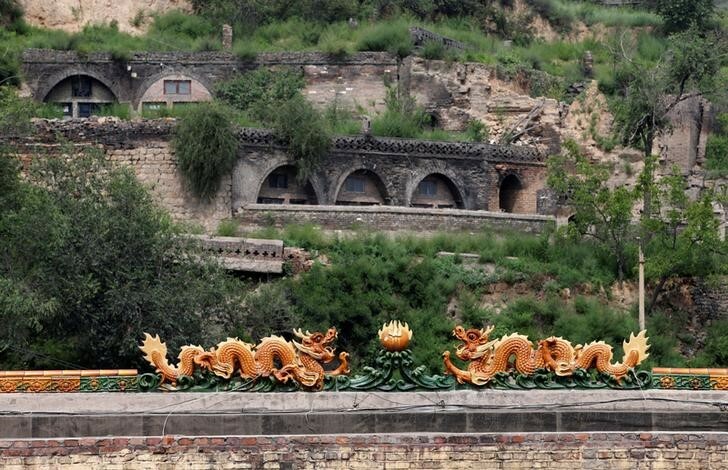 A dragon rooftop decoration is seen in an area where land is sinking next to a coal mine in the abandoned Duxigou village of Xiaoyi, China’s Shanxi province, August 2, 2016. Photo: Reuters/Jason Lee. Mine-induced subsidence is not unique to China, but its problems dwarf those of other countries. A notice board at a deserted Communist Party building in an abandoned village not far from Helin gives an idea of the scale of the disaster. A man drives in front of a power plant next to a coal mine on the outskirts of Xiaoyi, China’s Shanxi province, August 2, 2016. Photo: Reuters/Jason Lee. According to official data, coal mining had already caused as many 26,000 geological disasters by the end of 2014, and as much as 10,000 square kilometers of land has been affected, an area the size of Gambia in Africa, according to some estimates. China’s land ministry said last month it would spend 75 billion yuan ($11.27 billion) over the next five years to restore mined land and treat mining waste nationwide. 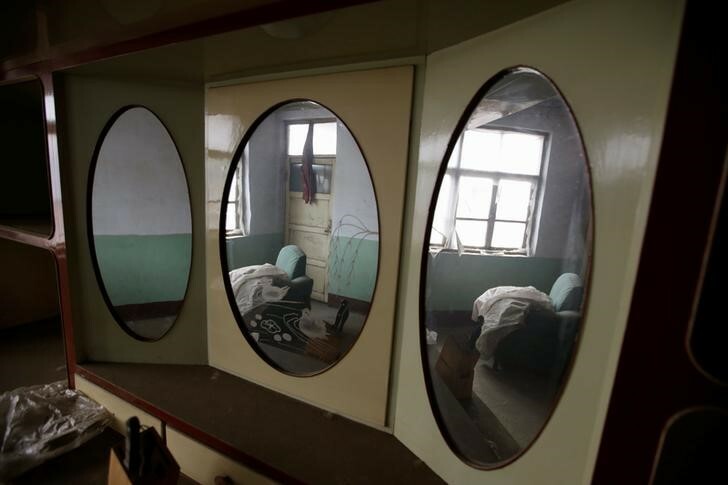 A room that is no longer in use is seen inside Gao Xiuzhen’s damaged house in an area where land is sinking next to a coal mine, in Shiyanzhuang village of Datong, China’s Shanxi province, August 1, 2016. Photo: Jason Lee/Reuters. 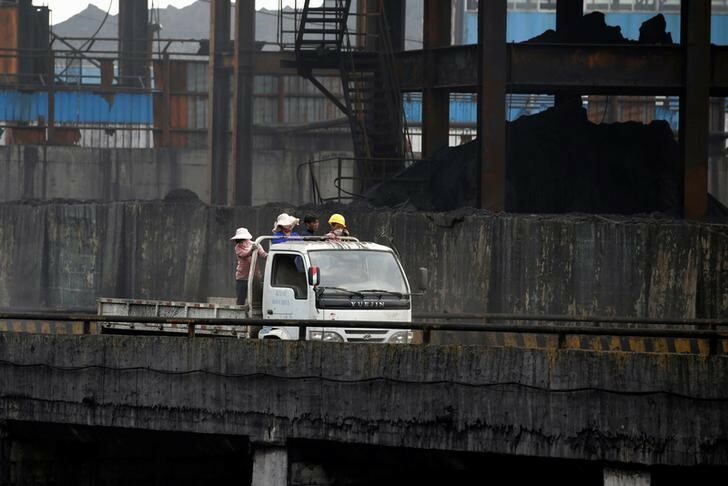 The growing environmental bill comes at a time when China’s stricken coal sector faces mounting debts, falling demand and a long-term decline in prices after the boom turned into a bust. 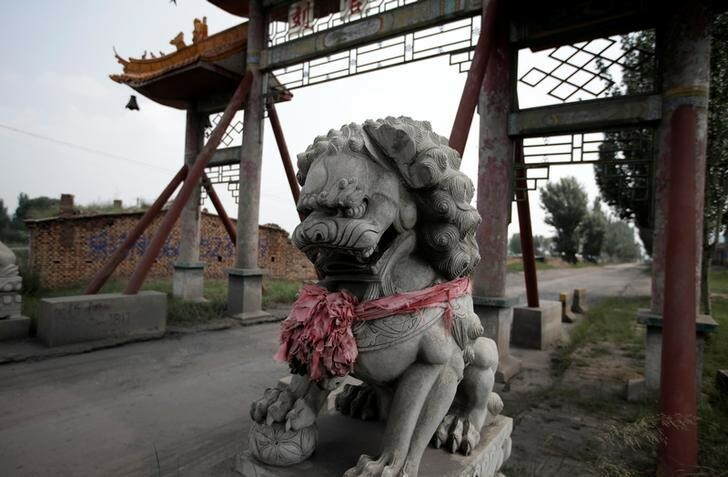 A lion statue stands at the main entrance of an abandoned Liuguanzhuang village in an area where land is sinking next to a coal mine in Datong, China’s Shanxi province, August 1, 2016. Photo: Reuters/Jason Lee. 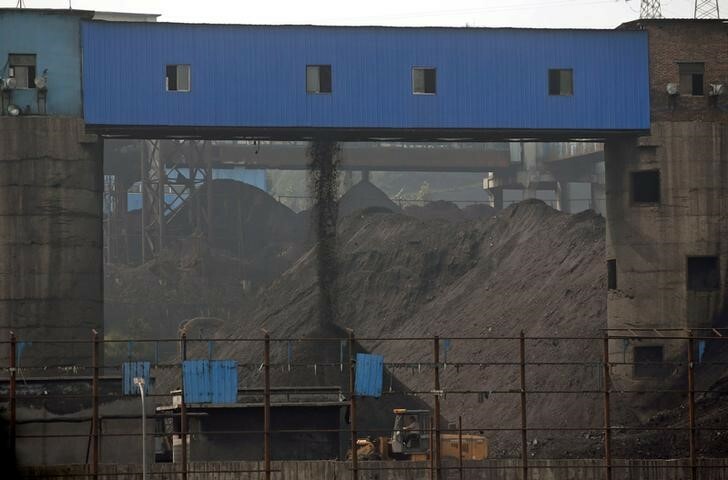 The coal sector, as with other basic industries in China such as steel, is now saddled with overcapacity estimated at around 2 billion tonnes a year, as demand growth slows and the country promotes cleaner forms of energy. 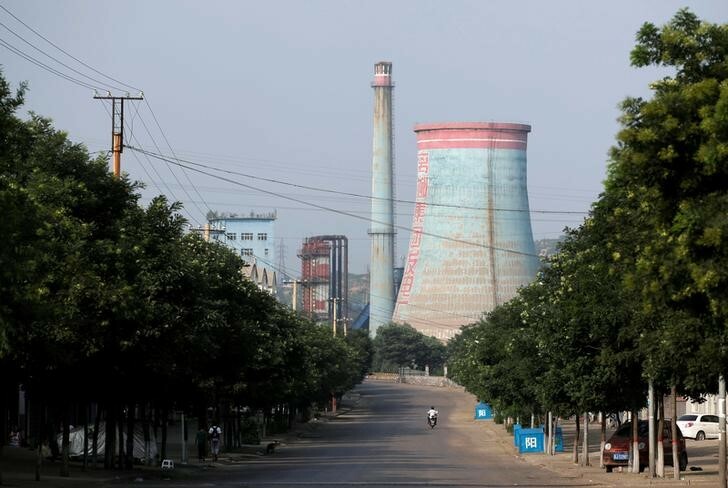 China planned to close around 1,000 collieries this year alone, many of them in residential areas such as Helin, as it cuts coal’s share of total energy consumption to 62 percent by 2020. 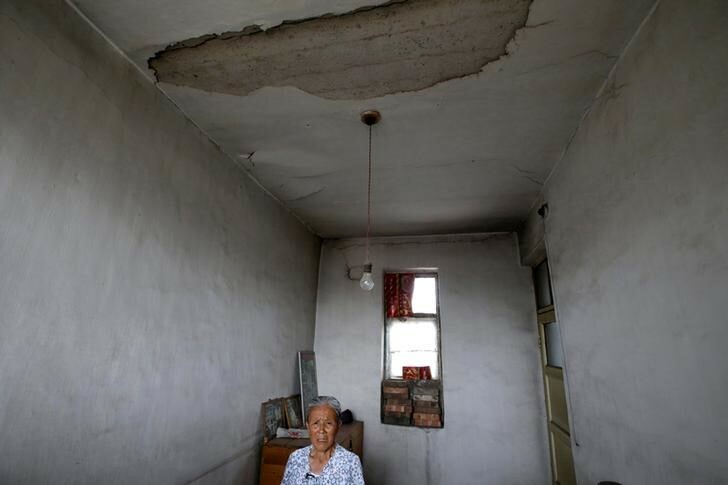 Gao Xiuzhen, 81, stands inside her damaged house in an area where land is sinking next to a coal mine, in Shiyanzhuang village of Datong, China’s Shanxi province, August 1, 2016. Photo: Reuters/Jason Lee. During the boom years, as prices and profits soared, miners were encouraged to dig further and deeper, encroaching upon residential areas and farmland. 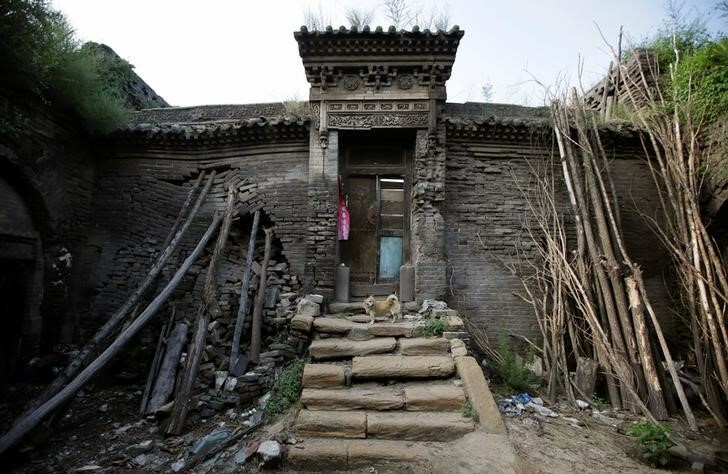 Tree trunks and rocks are set up to support a leaning wall of Li Yonghua’s damaged cave house in an area where land is sinking next to a coal mine, in Helin village of Xiaoyi, China’s Shanxi province, August 2, 2016. Photo: Reuters/Jason Lee. 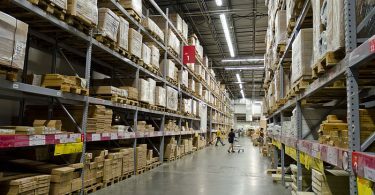 While large state-run firms would often relocate entire villages, smaller private miners, chasing quick profits, simply dug under and around communities. With mining tax revenues surging, local governments were reluctant to impose stricter controls on the industry. 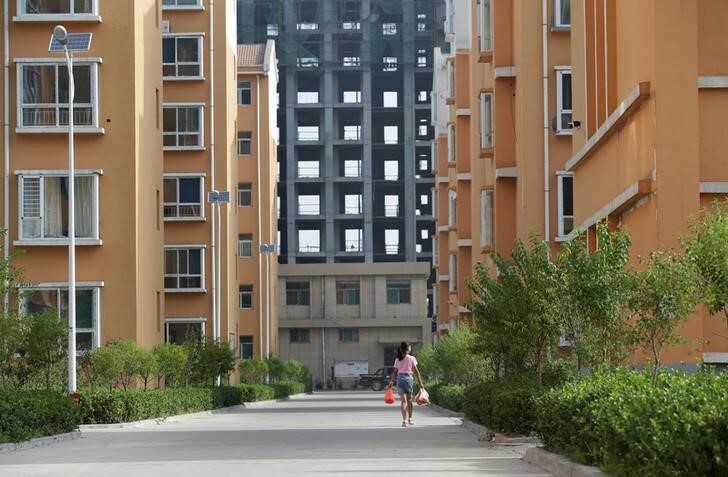 The industry helped pay for construction binges like one in Xiaoyi, where Helin is located, topping up local government tax coffers and bestowing the city center with rows of largely unoccupied luxury apartment blocks. Workers stand on a truck at a coal mine on the outskirt of Xiaoyi, China’s Shanxi province, August 3, 2016. Photo: Reuters/Jason Lee. 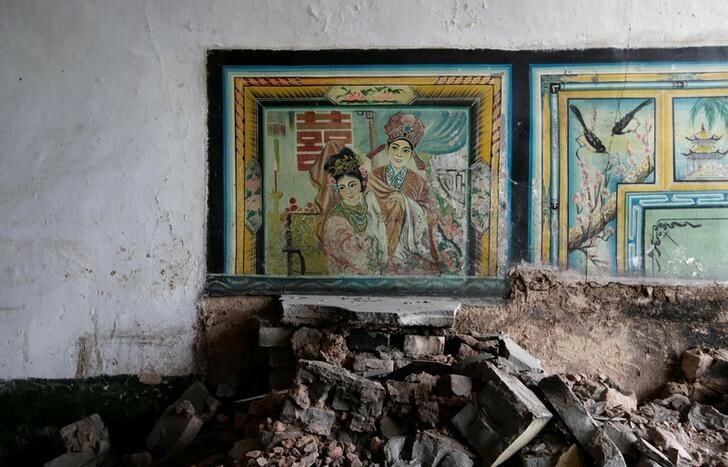 What was once a boon for governments has now turned into a burden: Xiaoyi has already spent more than 6 billion yuan ($901.31 million) to treat subsidence, the government said. Together with the neighboring city of Luliang, it plans to relocate as many as 230,000 people over 2014-2017. 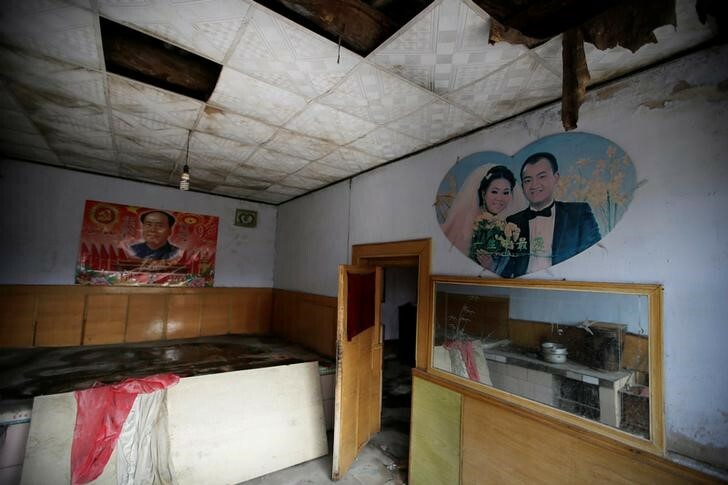 A wedding picture and a poster with the image of China’s late Chairman Mao Zedong are seen on a wall inside a damaged room of Zhang Chungou’s house in an area where land is sinking next to a coal mine, in Shiyanzhuang village of Datong, China’s Shanxi province, August 1, 2016. Photo: Reuters/Jason Lee. Little of the money to move communities and restore the land is coming from the miners themselves, although that was supposed to be the plan in the beginning. 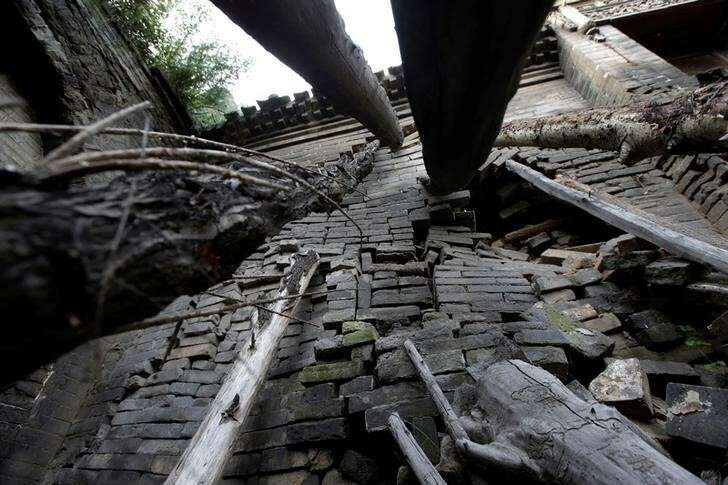 Tree trunks are set up to support a leaning wall of Li Yonghua’s damaged cave house in an area where land is sinking next to a coal mine, in Helin village of Xiaoyi, China’s Shanxi province. Photo: Jason Lee/Reuters. Miners are required to pay “subsidence fees” to pay for the cleanup when their mines close. The Datong Coal Industry Group, the only state miner to give breakdowns, paid just 1.4 million yuan in those fees from January to March this year, or 0.04 percent of its total costs, according to its quarterly report. 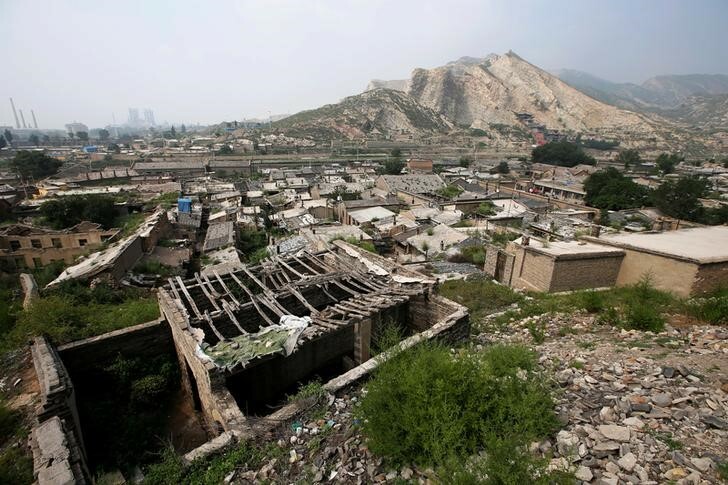 Abandoned houses are seen in an area where land is sinking near a coal mine in Kouquan township of Datong, China’s Shanxi province, August 1, 2016. Photo: Reuters/Jason Lee. Jiang Jian, a legislator from Shandong province, said Beijing needed to draw up detailed measures to determine how much mining firms should pay. 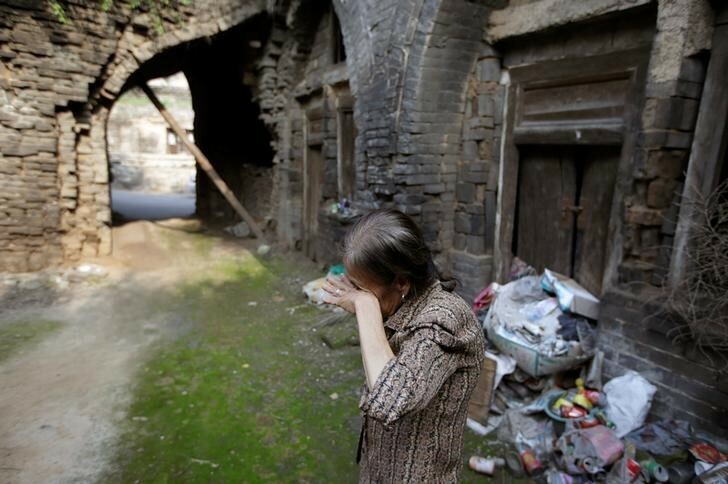 Many of the worst-hit sites have been long abandoned, making it harder to decide who is responsible, she noted, so Beijing also needed to set up dedicated funds to help pay remediation costs, including treatment and disposal of mine waste. 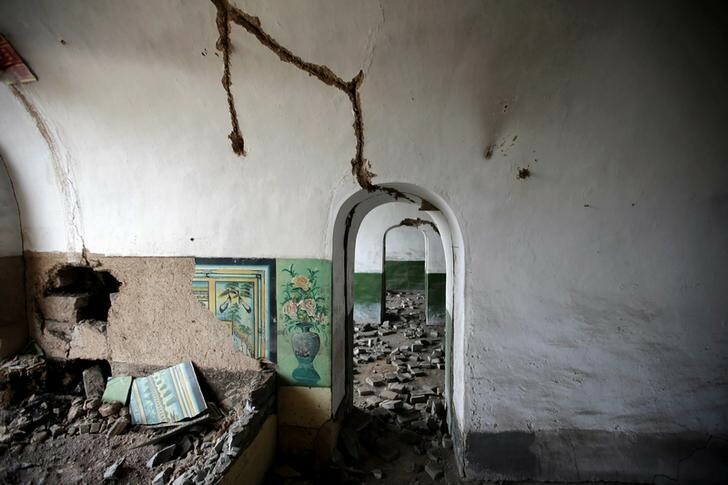 Damaged walls are seen inside an abandoned cave house in an area where land is sinking next to a coal mine in the deserted Liuguanzhuang village of Datong, China’s Shanxi province, August 1, 2016. Photo: Jason Lee/Reuters. To help with the clean-up, China is encouraging developers to turn abandoned mining sites into wind and solar power projects. Solar accounted for just 0.6 percent of China’s overall electricity generation from January to June, and wind was a mere 3.6 percent. One solar demonstration project has been completed in the eastern outskirts of Datong, also in Shanxi, on ground damaged from mining and not suitable for farming. 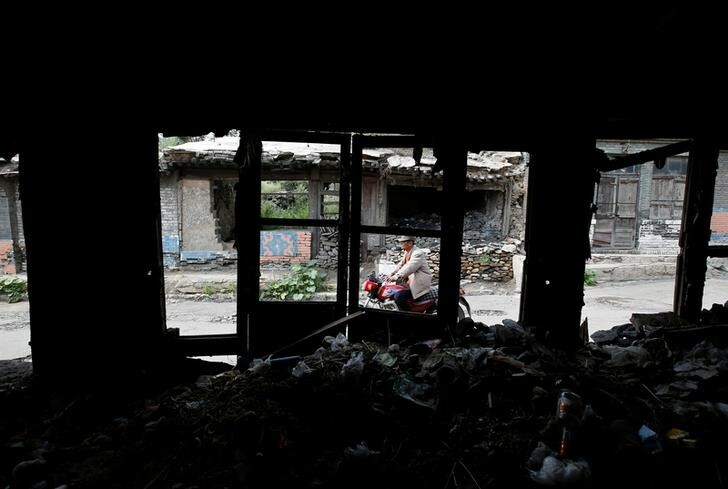 The area was once a prosperous coal region with more than 1,000 mines, but extraction stopped after the collapse in prices, and the local economy cratered. A girl walks in a neighbourhood for resettled residents, who used to live in areas where land is sinking next to coal mines, in Xiaoyi city, China’s Shanxi province, August 3, 2016. 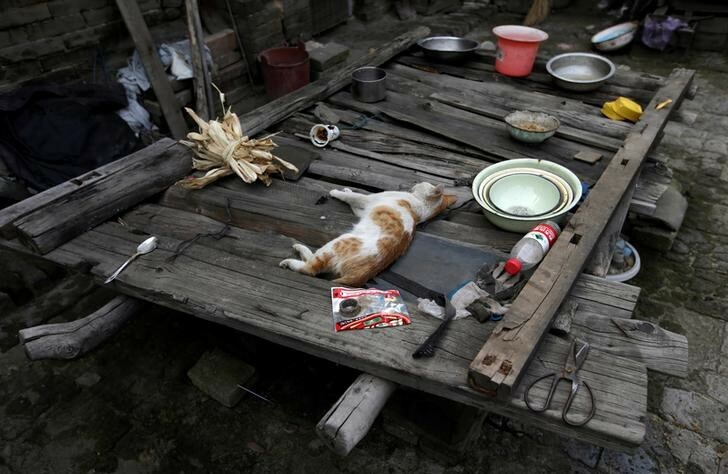 Photo: Reuters/Jason Lee. 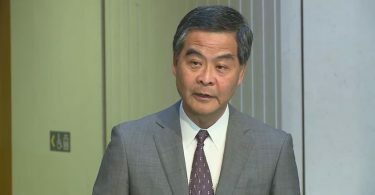 “Before we got here this piece of land wasn’t suitable for any kind of planting, but now at least some of it can be used,” said He Xin, project manager with the United Photovoltaics Group, which owns and operates a 100-megawatt solar farm at the site.